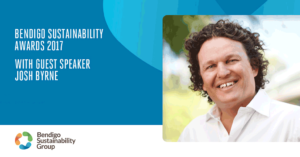 Dr Josh Byrne will feature Density by Design and Josh’s House at upcoming events that form part of the 2017 Bendigo Sustainability Awards being held on World Environment Day Monday the 5th June. The first presentation is on Density By Design and he will look at how good design can address densification in our cities and how it is pivotal to creating livable environments closer to our city hubs. Josh will share highlights from some of the leading medium density residential and mixed use projects from around Australia that are helping to shape the future of urban development. Josh’s second presentation will be delivered as part of the Bendigo Suitability Awards Ceremony, where he will provide an overview of Josh’s House and outline the next steps for his research into mainstreaming sustainable housing with the CRC for Low Carbon Living and why this is of critical importance. The Bendigo Sustainability Awards is a community initiative of the Bendigo Sustainability Group designed to celebrate the businesses, organisations, groups and individuals in the community that are innovating and making small yet significant (or big) changes towards a more sustainable way of life.